The Luxi mattress is a very special bed in that each side of it can be altered to find your exact preference. 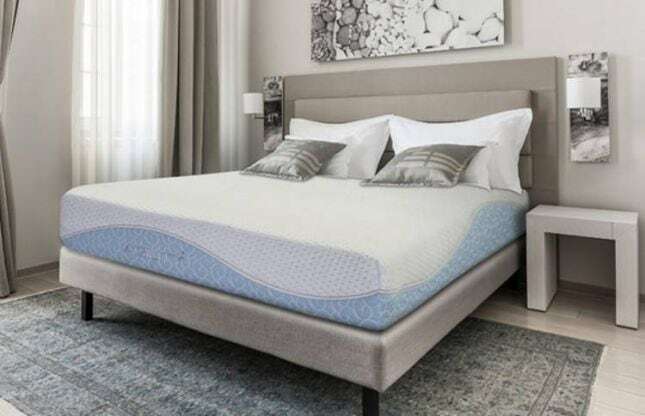 This mattress comes with a zippered cover that allows you to adjust each side of this split mattresses individual layers to be soft, medium of firm. This makes it great for couples who may have different preferences or over time feel the need to adjust their preferences. 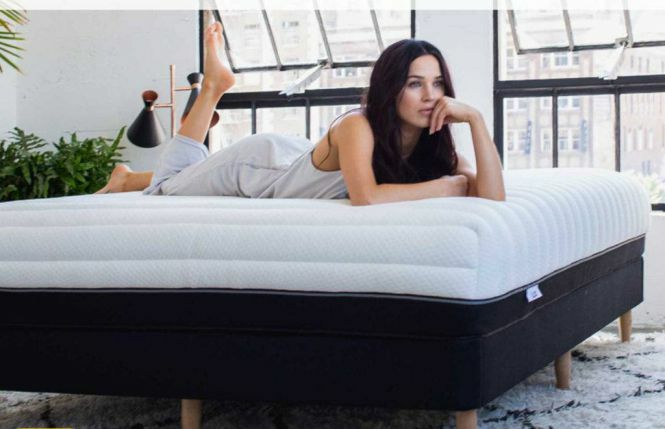 The Luxi mattress is about 11″ thick and has a latex and memory foam layer on the top and then a unique Support Balancing layer and base foam. This technology driven support layer is uniquely shaped and is optimal for heat dissipation, pressure relief and spinal alignment. This mattress even comes with a 100 night trial period as well as a 1000 night sleep pledge. This mattress makes it easy to find the perfect feel just for you. Below we have our comprehensive and detailed review for the Luxi mattress. We will go through how it performs for off gassing, comfort, motion transfer, sleeping cool, edge support, value, material, trial and warranty. Also, remember that if you have questions or need more insight during your mattress buying journey, please feel free to contact us. We are here to help and make sure you find the best mattress for you! The very first thing to do with your new Luxi mattress is take it out of the box and get it set up. It should show up right at your door and in a fairly compact box, for a mattress anyway. Getting it to where it needs to go may take two sets of hands. It is about 80 lbs and a little awkward to maneuver if you’re on your own. Once you get it to where you’ll be sleeping it should only take a few minutes to get it out of the box and take it out of the plastic and come to life. During the unboxing process you will notice a bit of off gassing but it should be very minimal. With most boxed mattresses there will be a little bit of smell once it is allowed to unroll and take shape, but this one is made in the US which helps tremendously with cutting down on any noxious odors. It should be fine within a few hours but if you are more sensitive to certain smells letting it breath up to 12 hours would probably be a good idea. When setting up your new mattress it will need a foundation that provides a flat, even surface that will support the weight of the mattress as well as the sleepers. It also will need to be the right height for you as well as be aesthetically appealing. The Luxi mattress would work great on a box spring with or without a frame, an adjustable base, a platform bed or slatted bed. To find a foundation that would work for you check out our frames & bases reviews. 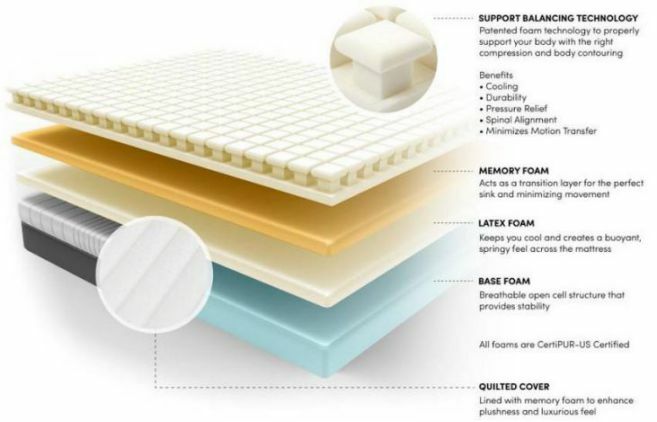 The Luxi mattress uses a four layers of foam to create their 11″ mattress. The comfort layers include a layer of patented support balancing technology foam. This layer is uniquely shaped and is great for pressure relief and spinal alignment. Next is a layer of memory foam great for contouring comfort and weight distribution. And there is also a layer of latex that adds responsiveness and bounce. The amazing thing about this mattress is the ability to shift the order of these layers to create the perfect feel and comfort level for you. Each side of the mattress can be adjusted by simply re-stacking these layers to find your ideal feel and preference. This 3 in 1 mattress gives you a chance to add a bit of softness or firmness depending on what works for you. This mattress is an all foam mattress and like any all foam mattress it should have minimal motion transfer. However, the comfort layers made of support balancing foam will be more responsive which may produce more vibrations than the memory foam. However, this mattress should have very minimal movement felt. 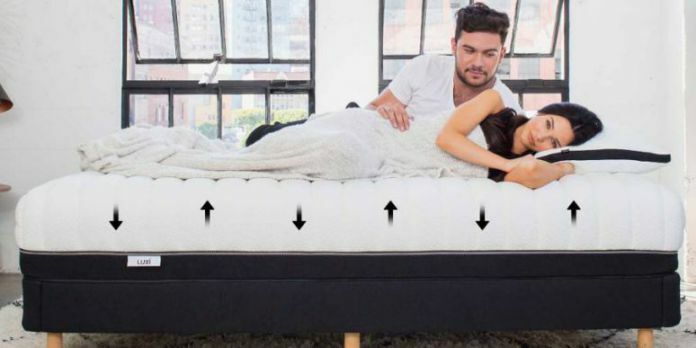 The Luxi mattress would still be good for anyone who shares a bed because of this, there will be little disturbance when getting in and out of bed. 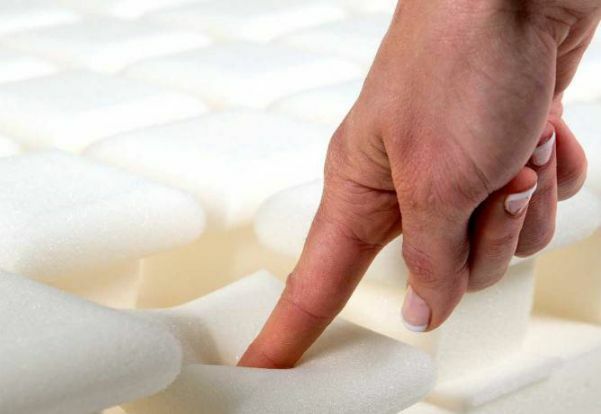 The Luxi mattress has a patented uniquely open shaped support balancing foam. This foam allows for air to flow in all directions and minimizes any heat retention. This mattress also includes a layer of latex which also is naturally aerated and should dissipate heat too. For an all foam mattress the materials and design help limit the build up of heat and will work for a warmer sleeper. The edge support on the Luxi mattress should feel fairly stable and create an edge to edge usable sleep surface. The base foam should provide the necessary support to give the entire mattress a solid foundation, including the edges as well. Sleeping on this mattress you should feel a consistent feel across the entire top of the bed. As far as sitting on the edge goes, there is going to be a little less support, because there isn’t any foam encasement. So sitting on the edge may be less ideal and not feel very solid. The Luxi mattress comes in at $1299 for a queen size and that includes free delivery, a 1000 night sleep trial and a 10 year warranty. The mattress alone we find to be a good deal for a solid, unique bed that has a quality foams and an adjustable 3 in 1 comfort option. What makes it even better is that you can save an additional $75 just by using the code: LUXI75. Our Sleep Guide has the latest pricing as well as any and all available coupons or discounts for the mattresses we review. We have a direct relationship with Luxi and make sure that we pass along the most up to date savings and discounts to our readers. The trial period for this mattress has an astounding 1000 night sleep pledge. The ability to access the layers has given Luxi the advantage of creating an ideal feel that is just right for you. For some reason if they are unable to make the mattress work they will fully refund you and donate your mattress. If you are looking for more specifics for the Luxi trial period find out more at luxisleep.com or for a helpful tool check out Our Mattress Warranty & Trial Period Guide. The Luxi mattress comes with a 10 year warranty. This warranty length is fairly standard and ensures that this company stands behind their product. This should provide plenty of confidence to the customer that this mattress will be taken care of if any issues arise. 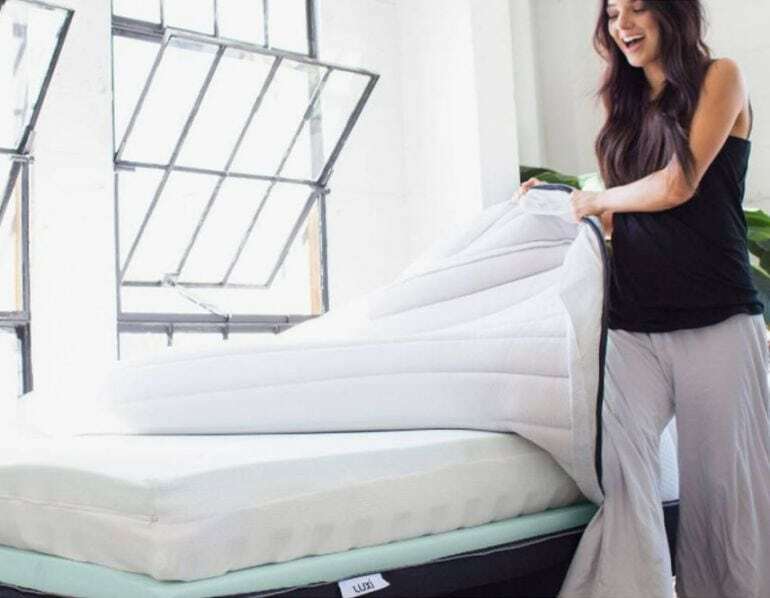 If you are looking for more specifics for the Luxi warranty find out more at luxisleep.com or for a helpful tool check out Our Mattress Warranty & Trial Period Guide. You like premium materials and an all foam mattress at an affordable price. You and your partner prefer different comfort options and would like the ability to adjust your side. You want an foam bed that still sleeps cool and is durable and solid. Still looking for some more information? Visit Luxi at luxisleep.com. Also, have questions for us? Please contact us and we would be happy to help you! CLICK BELOW to get the best and latest savings and coupons on your new Luft Hybrid Mattress. CLICK BELOW for the latest and BEST savings and coupons for the Helix Luxe Hybrid Mattress! Get the BEST price on the Loom & Leaf Mattress and FREE white glove delivery NOW. Click Below for the BEST pricing on your new Purple hybrid and FREE shipping! Get the BEST price on the Zenhaven Mattress and FREE white glove delivery service & removal NOW. Get the BEST price on the Saatva Mattress and FREE white glove delivery and removal NOW. CLICK BELOW to save $200 on any Bear Hybrid Mattress NOW!